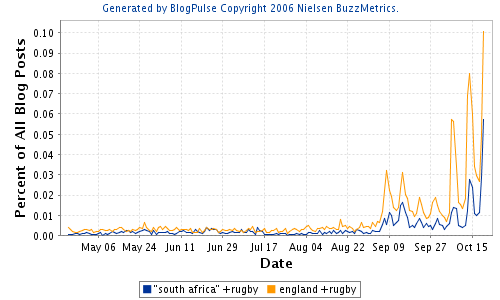 A quick formulation of queries against BlogPulse ("world cup" AND (team1 OR team2 OR team3 OR team4) suggests that Groups A and C are getting the most attention from the blogosphere. You may have noticed low posting volumes lately. This is due to some project work that we are in the middle of here in Live Labs. This should be a temporary reduction of signal, so stay tuned! For now, I thought I’d post some BlogPulse graphs showing attention around the Olympics. This next one gives a little bit of context. Superbowl: The Game or The Ads? Companies like BuzzMetrics and Cymfony - who monitor opinion and buzz in social media - are going to be eagerly watching the blogosphere today for mentions of the famously expensive commercials that show during the game. In my experience, the amount of blogging that gets done around these commercials, however, is often less than enough to draw any real conclusions about the effectiveness of the ads, the power of the brand and so on. Perhaps this year will be different. Success would require thousands of posts discussing and comparing ads as well as some background signal for brands and products with, one would hope, measurable differences in perceptions and buzz before and after the game. Note that these are numbers generated for today. 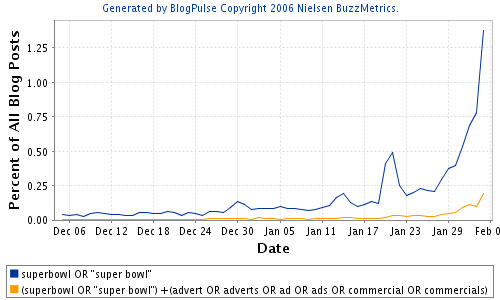 Nielsen hasn't updated BlogPulse with a new copyright string, unfortunately; nor are there dates on the graph.